Remember that Sesame Street segment, “One of these Things is Not Like the Other”? Can you pick which one of the four questions is out of place? And more importantly, why it is the misfit of the bunch? Which ice cream do you love most, Casey — strawberry or chocolate? Which is your favorite sports team, Jamie — the Broncos or the Patriots? Which is your favorite pop singer, Riley — Bruno Mars or One Direction? Which set of parents are your real ones, Payton — your birth parents or your adoptive parents? As you can surmise from the title of this post, the fourth option gets the ding-ding-ding. The first three have numerous options not mentioned — there’s also mint chocolate chip and peppermint ice creams, the Cubs and the Jazz, Rihanna and One Direction, plus countless other flavors, teams, singers. It’s only the last one that is a dual option — just two choices — winner and a loser. 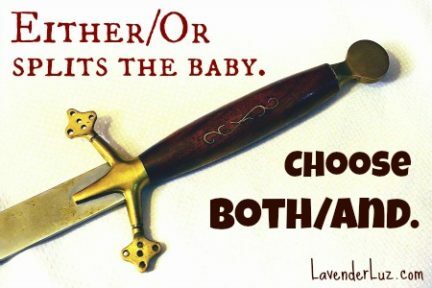 And it’s only the last one that can split a child in two in a way that choosing strawberry over chocolate simply can’t. If you’ve done much adoption reading, you’ve probably sought out posts by adult adoptees. Some adoptees claim they identify exclusively with their birth parents, saying that they never felt like they fit in with their adoptive family. Others explain that their “real” parents were the ones who raised them, changed the diapers, kissed the boo-boos, showed up at the games/performances/events. Neither answer is right or wrong. What’s wrong is asking the question in the first place. Often, it’s not the parents asking; rather it’s society-at-large wanting a definitive answer to the age-old question of Nature vs Nurture. Posing the question or asking for a ranking comes from an Either/Or paradigm that splits the baby/child/tween/teen/adult in two. It’s dualistic, starkly black and white, pitting a winner against a loser. Either we are the real parents or they are. Either we can legitimately claim the child or they can. While the baby in the King Solomon story was threatened with being sliced by a literal sword, adoptees are faced with a figurative sword splitting their hearts, their loyalties, their psyches, their identities. This happens anytime the adults around them operate from the Either/Or paradigm. Parents in adoption who want to avoid splitting the baby must make a subtle (and not difficult) shift into Both/And thinking. Adoption creates a split between a child’s biology and biography. Openness is an effective way to heal that split. That’s the premise of the book I’ve written with my daughter’s first mom, The Open-Hearted Way to Open Adoption: Helping Your Child Grow Up Whole. Openness, referring to not only contact but also to the mindset in which we parent, shifts us into a Both/And paradigm, in which we move from duality toward unity. We multiply instead of divide. We offer to our children wholeness rather than fracture. We encourage them to claim all pieces of themselves, those from biology and those from biography. We enable our children to be claimed by both of their clans. And we resolve in ourselves any need to be The One. That often-unconscious drive that influences our adoption relationships is more about us and not at all about our child. I’ve got two kids. I’m not half a mother to one, and half a mother to the other; I’m a full mother to both of them. That doesn’t mean I’m two halves…or two people. I’m simply a mom with two kids. So, by extension, I prefer to think of myself as existing fully in my two families — my birth family AND my adoptive family. BOTH. Isn’t it enlightening how Torrejon reverses the generations to make her point? By splitting the parent between the children we can see the ridiculousness of splitting the child between the parents. We would have no problem allowing Casey to have a scoop of strawberry today and a scoop of chocolate tomorrow. It would be no trouble if Jamie cheered for the hometown baseball team in June and the hometown basketball team in November. We wouldn’t feel challenged if Riley had both Bruno Mars and One Direction in the same playlist. Likewise, let’s allow — encourage — our children to expand their hearts so big that they can encompass all the people with whom they identify, whom they have an innate need to claim and be claimed by. Doing so need not take away from us — it merely adds to our children. 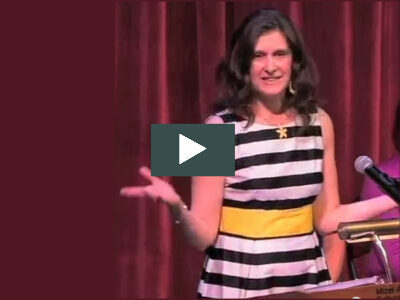 What have you done (or might you do) to shift from Either/Or thinking to Both/And thinking? What ideas do you have to avoid “splitting the baby”? 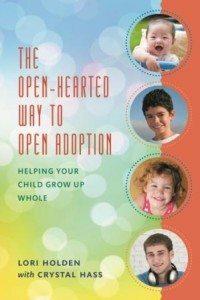 Last week Executive Director Dawn Davenport and I talked about openness in adoption via podcast. To summarize our BlogTalk Radio interview, Dawn wrote her post, My #1 Secret Tip for a Successful Open Adoption, adding to the vast resources of CreatingAFamily.org. In an age where so many families are mixed (i.e. mom, dad, moms, dads, stepmom, stepdad, half siblings, step-siblings, aunts, uncles, “aunts,” “uncles” and all combinations in between), it still boogles my mind that we are so intent on putting labels on a situation in order to feel comfortable. I agree with your observation that making a child answer this type of question sets of precedence for a right vs. wrong answer. And that’s just tragic because then we are not only limiting a child but we are also limiting love. Haven’t we learned by now? Honestly, I think reversing the mindset of one vs. the other is to bring terms like “splitting the baby” to the forefront of conversation. I like this because it calls people on their outdated thinking while also encouraging them to rethink family. That just as Torrejon said beautiful, to allow everyone not to split themselves into pieces but instead expand the boundaries. Although we’re still very early in our relationship (our daughter is 9 mos old), the way that we have addressed this is to talk about THE (singular) family that we intentionally, with deep love and mindfulness, created for our daughter E. Ellie’s family includes all of the adults who came together to create a family to care for her. Her family includes her moms, both bio and adoptive, her grandparents, both bio and adoptive, as well as countless aunties, uncles and cousins. She also has two “grandmasbychoice” (their self-appointed title) who aren’t adoptive or bio but are just dear dear friends. All of these people are Ellie’s family. Her family includes various households with different traditions, cultures, favorite foods, silly songs and nicknames. But it’s one family, created with her at the center. I guess my feeling about this is…this would be a really good thing to teach adoptive/birth parents, so they can teach their children. Because the average person just asks a shorthand type of question to try and comprehend something that is huge in scope and way outside their experience. So I don’t fault people for the labels. I find it good that they’re curious and want to learn. But the adoptee should be taught Torrejon’s explanation as one approach, so that they don’t feel split by an uneducated inquiry – they recognize the opportunity to teach. 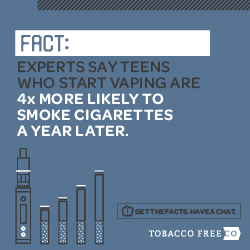 It seems like there’s a lot of time spent on making sure people are suited to adopt and parent, and not much time spent on educating them on the best way to do it. I’ve taken an active roll in educating the children in our family about all four of us who are parents to my son. We all love him and we are all a part of what makes him who he is. In educating the children, I have enlightened the adults. The domino effect has been pretty awesome. You are such a good advocate for your children and for openness in adoption, Lacie. I can’t imagine how difficult it would be for a child to feel responsible for healing her parents’ unhealed wounds, to feel like you’re walking in a minefield with a mother or father, and that you must be so careful not to accidentally detonate something. XOXO, JoAnne. I really love anything that moves from either-or thinking to both-and thinking. Division is really only good in math class. And even then it was tricky. Multiplying is way more fun. Torrejon’s analogy makes a lot of sense; I hadn’t come across it before, but it’s so simple and so true. Thanks Lori! I love your take on math, Addison! Our society is so eager to slap labels on things… when so often, it’s so much more complex than a word or two can ever convey. I’m not an adoptive parent but your outlook and Torrejon’s explanation speak to me in a way no other viewpoint about adoption does. Truly a brilliant post! Weird, I was trying to comment specifically on others’ comments, but they showed up at the end?! My first comment was meant to be in reply to Addison and your comments/discussion and the second in reply to Loribeth’s. Anyway, I love this post and so many of your insights here… I too really appreciate how so much isn’t and shouldn’t be black and white in life. There is mostly grey area and get that more and more, the older I get and the more I marinate (as I think you told me/described the process of aging/maturing recently). I love the math of 1+1=1. it’s so simple. it recognizes the value of everyone, the need to integrate and build the child’s sense of wholeness, the idea that one does not detract from the other. wonderful! Lori, I just love this!! Our son knows all the members of his family and doesn’t separate them by his B and A family! They are all just his family! Soo much love!! Lori, i am trying to wrap my head around this. How do we live out Both/And from a foster adoption perspective? They were taken from their birth parents for good reason. We have all of the info, the original birth certificates, case files, all of that. But, no contact with birth parents. And we have been advised not to for safety reasons(the caseworker made a point of me seeing one of the parents via a one way mirror so I would know if I ever ran into him to run the other way). I want to give our kids this wholeness. The best we have been able to do is some contact with a paternal grandmother for one child. And, we know the adoptive parents of the other childs older siblings…but, we have no control over contact. So far they mostly shy away from it because it is so upsetting for their kids. No matter what we do these folks will not be a part of their lives in the every day. But a couple of things may help reframe this. One, contact is not the same as openness (please see this grid for explanation. We sometimes use the terms interchangeably, e.g. “if we have contact, it’s an open adoption; if we don’t, it’s a closed adoption.” But I believe that even without contact — like for international (perhaps not possible), foster (perhaps not wise), or infant (perhaps birth parents are absent for their own reasons) — parents can parent with openness. Contact is what happens between the sets of parents; openness is what happens between parent and child. I wish to add that always, there must be moments of discernment. Having contact just to be open, even if it puts the kiddo in distress, may not be the best strategy. I would advise working with a therapist to see if the older kids (under the care of the other adoptive parents) getting upset is from something that needs to be healed/addressed or from something that needs to be avoided. Without knowing the specifics, I couldn’t say. But attunement, discernment, and the guidance of an adoption-competent therapist can help you. I can see that you’re dealing with a whole lot of complexity. Secondly, Addison Cooper, LCSW with a foster agency in California recently guest posted . He addresses your concerns exactly in this post. Finally, this article came across my radar just this week. Take a look at all the various nuances of openness and contact, and what closing down to biological family completely may do to the child. Thank you so much for asking and I wish you well.